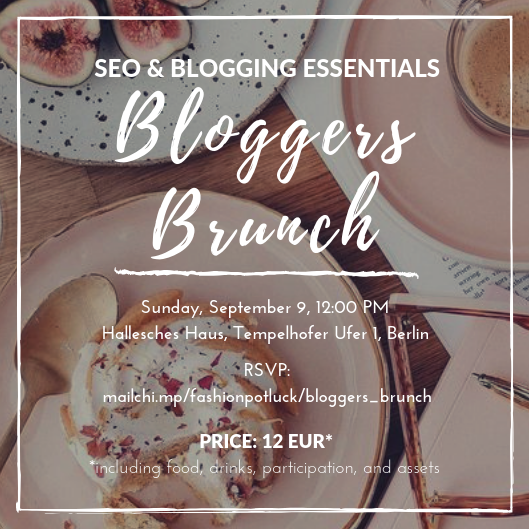 We are inviting you to join our SEO & Blogging Essentials Brunch in Berlin. It will be an interactive lecture with tips, useful assets, good company, mimosas, and delicious food by Hallesches Haus! The brunch will be hosted by Julia Mitereva, the marketing director of FashionPotluck.com. Together we will discuss SEO & blogging tricks and problems; we will talk about your challenges and will provide you with useful assets and advice for improving your social media presence. We will enjoy the delicious brunch and will take some memorable photographs together! After reserving the place, you will get more information about the brunch sent to your email.